We consider systems of finite automata performing together computation on an input string. Each automaton has its own read head that moves independently of the other heads, but the automata cooperate in making state transitions. Computational power of such devices depends on the number of states of automata, the number of automata, and the way they cooperate. We concentrate our attention on the last issue. The first situation that we consider is that each automaton has a full knowledge on the states of all automata (multihead automata). The other extreme is that each automaton (called also a processor) has no knowledge of the states of other automata; merely, there is a central processing unit that may “freeze” any automaton or let it proceed its work (so called multiprocessor automata). 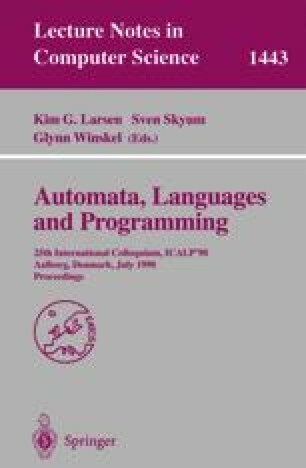 The second model seems to be severely restricted, but we show that multihead and multiprocessor automata have similar computational power. Nevertheless, we show a separation result. initially this research was supported by Polish KBN grant No. 2 P301 034 07.